Retinal detachment is when your retina (the light-sensitive layer of your eye) separates from the back of your eye. This can permanently affect your sight, so it’s important to seek expert advice straightaway (within 24 hours). If you have symptoms that you think may be due to a retinal detachment, make an urgent appointment with an optician if you can. If this isn’t possible, go to the hospital accident and emergency department or contact your GP. Your retina is a thin layer of nerve tissue that lines the inside of the back of your eye. When light travels into your eye through your pupil, it's focused onto your retina. The cells of your retina send signals to your brain, which interprets them as the images you see. In the centre of your retina there’s a small area called the macula, which is responsible for what you see right in front of you. The macula is important for detailed activities such as reading. If you have a retinal detachment, this thin layer of light-sensitive nerve tissue separates from the layers beneath. When this retinal tissue isn’t in the right position, your vision can become increasingly distorted and blurred. Retinal detachment usually just affects one eye, but both can be affected. Most retinal detachments happen in people aged between 60 and 70. There are three ways that your retina can detach from the back of your eye. This is the most common type of retinal detachment. It can happen if a tear or hole develops in your retina (rhegmatogenous means ‘caused by a tear’). This can cause fluid in your eye to seep underneath your retina and separate it from the back wall of your eye. This type of retinal detachment is often caused by shrinkage of the gel (the vitreous) inside the back of the eye. This shrinkage happens as part of the normal ageing process. For more information, see our FAQ on Posterior vitreous detachment (PVD) below. In this type of retinal detachment, your retina is pulled away by scar tissue within your eye. This can happen if you have an abnormal growth of blood vessels in your eye, most often in people with diabetes. It can also happen if you injure your eye or have inflammation within it. This is a rarer type of retinal detachment. If the blood vessels underneath your retina start to leak fluid, it can build up underneath your retina. This can sometimes cause your retina to detach. There are many reasons why this can happen – for example, having severe inflammation in your eye. These may be followed by a ‘dark curtain’ or shadow spreading across the vision of one eye. If the central macula area of your retina detaches, your sight may be severely affected. If you get these symptoms, you should seek expert advice within 24 hours. Try to get an urgent appointment to see an optician (optometrist). If you can’t, go to the hospital accident and emergency department or contact your GP. The sooner you seek expert advice, the less chance there is of permanent damage to your sight. Your optician or GP will ask about your symptoms. You’ll have some tests to check your eyesight. For example, they might look at the inside and back of your eyes with an ophthalmoscope. Your optician will have access to more special equipment to examine your eyes than your GP. Ask a friend or relative to drive you to your appointment as these tests might affect your vision for a couple of hours afterwards. If your optician or GP suspects your retina is detached or is at risk of detaching, they‘ll refer you urgently to an ophthalmologist. You might then have other tests such as an ultrasound scan. Your doctor will discuss what treatment is best for you in your circumstances, but you’ll usually need to have surgery to reattach your retina. Your doctor may recommend this is done within 24 hours or within a few days, depending partly on which part of your eye is affected. If your macula (for central vision) isn’t affected yet, urgent surgery may prevent this happening. This means it’s more likely your vision will return to normal. If your macula is already affected, then a few days’ delay won’t make such a difference. In more than eight out of 10 people, one surgical procedure is enough to repair their retinal detachment. But some people need more surgery. There are three types of surgery for retinal detachment; they are described below. They all aim to make your retina lie flat against the inside of your eye again. In each case, your doctor will also repair any tears or holes using cryotherapy (cold treatment) or laser (light) treatment. Vitrectomy. Your doctor removes the vitreous (clear gel) from the back of your eye and replaces it with either a gas bubble or, less commonly, a silicone oil bubble. This holds your retina in place while it heals. The gas bubble slowly disappears over about six weeks. If your doctor uses a silicone oil bubble, this may need to be removed later. Scleral buckle surgery. In this procedure, your doctor attaches a thin band of synthetic material to the outside of your eye. This presses on the outside of your eye, which causes the inside wall of your eye to move inwards slightly. This pushes the inside of your eye against the detached retina and into a position that helps it to reattach. Pneumatic retinopexy. Your doctor injects a small gas bubble over the site of your detachment, without removing any of the vitreous. This bubble then presses the retina back in place. This procedure is only possible if your retinal detachment covers just a small area. Retinal detachment surgery can often be done under local anaesthetic but sometimes general anaesthetic is best. This may depend on the type of surgery you have, and your particular circumstances. Your doctor can discuss with you which type of anaesthesia is best for you. After retinal reattachment surgery, you’ll be given antibiotics and corticosteroid eye drops. These will help prevent infection and reduce any inflammation. After surgery, your eye may feel bruised and your eyelids may be sticky. Your eye may feel uncomfortable for a few weeks. If you need them, taking over-the-counter painkillers should help. Your doctor or nurse will give you advice about what to do when you get home, including any restrictions to your usual activities. Most people will have some restrictions for a few weeks. This may include special positioning of your head for a week or so. Ask your doctor about going back to work, flying and driving again (and see our FAQs below). If you have any particular sporting activities you want to resume or take up, ask your doctor about them. Contact sports which may involve blows to the eye aren’t recommended if you’ve had a retinal detachment. It’s important to follow any advice your doctor gives you. You may have blurry vision for a few days or even weeks after your surgery. It usually takes about six to eight weeks before you and your doctor can get an idea about how well your eye will see again. If you’ve had gas put into your eye, your doctor may ask you to keep your head in a certain position afterwards at home. This keeps the gas bubble pressing against the repair in your retina, to help it heal. This special head positioning could be on one side or face down and is called ‘posturing’. Your doctor or nurse will give you clear instructions on how to do this. You may need to do this for about a week to 10 days after your operation. Having someone at home with you during this time would be very helpful as your activities will be restricted. While any gas remains in your eye your vision will be blurred. This will gradually improve as the gas disappears. You may notice a line across your vision that will move down and disappear over the next weeks or months. You won’t be able to travel in an aeroplane while any gas remains in your eye. This is because the change in air pressure can expand the bubble of gas and increase the pressure inside your eye. If you need a general anaesthetic for a surgical procedure while you still have gas in your eye, tell your anaesthetist. This is because some anaesthetics can have an effect on the injected gas in your eye. Ask your doctor how long the gas will be in your eye because this can vary depending on what type of gas was used. Your doctor will give you a bracelet to wear if you have a gas bubble, which will tell medical staff which gas is in your eye. You should keep this on until you have been told that the gas bubble has fully dispersed. Causes of retinal detachment include the following. Age-related changes to your eye. As you get older, you’re more likely to get retinal detachment – usually when you’re over 60. One condition you can get as a natural part of ageing, called posterior vitreous detachment (PVD), can lead to retinal detachment. See our FAQ on Posterior vitreous detachment (PVD) below. Lattice degeneration. This is a condition where the outer edges of your retina become thinned in a lattice pattern. It may then tear or holes may form. Around one in 10 people have this condition. Short-sightedness (myopia). In young people with myopia, this may be due to lattice degeneration. Previous eye surgery for cataracts. If you’ve had a cataract operation, the jelly-like vitreous inside your eye can be disturbed. This may accelerate the normal ageing process of PVD. An eye injury. This may cause your retina to detach straightaway or it can happen months or even years later. A family history of retinal detachment can make you more likely to get it. Diabetic retinopathy. This is an abnormal growth of blood vessels from your retina that can cause bleeding and scarring, which can pull on your retina. The most serious complication of retinal detachment is partial or total loss of your eyesight. This is very likely if the condition isn’t treated. That’s why you should seek expert attention straightaway if you think you may have a retinal detachment. Having a retinal detachment in one eye increases the chance that it will happen in the other. This is because the same things that led to you getting a detachment in one eye may cause it to happen in the other eye. Some people have another retinal detachment in the same eye, even after treatment. All surgical procedures have some chance of complications. If you have surgery for a retinal detachment, your doctor can explain the possible complications of the procedure in your particular circumstances. Feel free to ask any questions you may have. If a tear or hole is found in your retina, you may be able to have preventive laser treatment or cryotherapy (cold treatment) to repair it. This may help stop a retinal detachment developing. You may be able to reduce your chance of getting a retinal detachment by helping prevent the causes. This includes wearing eye protection if you’re doing DIY or during sports like boxing or squash. This is particularly important if you have a higher risk of retinal detachment (see our section on causes of retinal detachment above). If you have diabetes, keeping it under control will help to prevent the eye problems that can lead to retinal detachment. If you notice symptoms of retinal detachment, getting them checked quickly can help prevent the detachment getting worse. It’s also good to have an eye test regularly, at least every two years, to check that your eyes are healthy. Can I still drive after surgery for retinal detachment? Can I still drive after surgery for retinal detachment? If you have a retinal detachment, it can affect your eyesight and, so your ability to drive. You should not drive if you think that your eyesight is too poor to drive safely. If you have treatment for a retinal detachment, your doctor can give you advice about when you can start driving again. It’s important to follow this advice. If you drive a bus, coach or lorry you must, by law, tell the DVLA you’ve had retinal surgery even if it was just in one eye. If you have a retinal detachment or surgery to treat one, you should also check with your motor insurer to see if this affects your cover. How long will I be off work after a retinal detachment? How long will I be off work after a retinal detachment? This will depend on the type of retinal detachment you had, how successful your treatment has been and the type of work you do. Ask your doctor for their advice. Your eyelids may be sticky and feel uncomfortable for a while after your surgery. You might want to wait for this to ease before you go back to work. You might have been told to hold your head in a certain position after your operation to help your retina to heal. This may be for up to 10 days after your operation, so it will delay your return to work. Although this might sound daunting, it’s worth persevering because it’s an important part of your recovery. If you normally drive to work or driving is part of your work, see our FAQ ondriving and retinal detachment below. If retinal detachment has affected your eyesight, you might need to make some adaptations at work. These could include using magnifiers or gaining access to larger print. Ask your doctor about the services available for people with poor vision. You can also get advice and support from the RNIB (Royal National Institute of Blind People). What is posterior vitreous detachment? What is posterior vitreous detachment? Posterior vitreous detachment (PVD) is a condition that affects the vitreous (a jelly-like fluid in the centre of your eye). As you get older, the vitreous begins to lose its shape and consistency, and can start to pull away from the back of your eye. PVD is a natural part of the ageing process and is very common in older people. By the time you're in your 80s, you have an almost nine in 10 chance of having PVD. It’s also more common in people who are short-sighted. PVD may happen without you noticing. It may cause new floaters or spots in your vision but no other serious visual problems unless you get a retinal detachment. You don’t usually need any treatment for PVD and you’re likely to gradually get used to any new floaters in your vision. The importance of PVD is that it can lead to tears in your retina, which may develop into a retinal detachment. Around one in 10 people with PVD get these tears. The symptoms of PVD are similar to those for a retinal detachment so it can be difficult to tell the difference. See our section on symptoms of retinal detachment above. As they may be the only symptoms that you have a tear in your retina, it's important to get your eyes checked. See an optician (optometrist) straightaway or contact your GP. Will a retinal detachment permanently affect my vision? Will a retinal detachment permanently affect my vision? It may do. It depends on whether or not your macula is affected by the detachment and how long your retina is detached before you get treatment. When your retina becomes detached from the back wall of your eye, your eyesight will be affected straightaway. It’s often described as a shadow or ‘dark curtain’ spreading across one of your eyes. In more than eight out of 10 people, the retina can be reattached and you usually only need one operation to do this. If you have the operation soon enough, your vision might be as good as it was before. Getting prompt treatment is vital to saving your sight. The longer your retina is detached, the less likely it is that your eyesight will fully recover. The greatest risk of permanent damage to your eyesight is if your macula becomes detached. 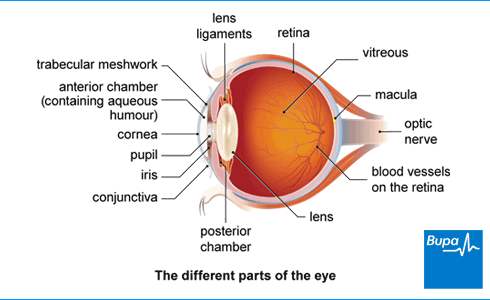 The macula is the part of your retina that processes the central part of your vision. If this is detached, the sight in that eye may never fully recover. If you think you have a retinal detachment, your best chance of avoiding permanent problems with your vision is to get expert help within 24 hours. Try to arrange to see an optician immediately. If you can’t, go to the accident and emergency department of your local hospital or contact your GP.